2017 has been an eventful year for Piet Renders (1). A fall at work resulted in a broken pelvis and a damaged spine amongst other injuries, and whilst he has recovered, he still has pain and limited mobility in his left arm which has prevented him from returning to work. The fall happened during the breeding season, but fortunately his wife took over the care of the birds and achieved a record result of 250 youngsters. Every cloud has a silver lining . . . When I arrived with Marko Dielen the day before the Lizarddag, Piet was busy training his birds. A stack of 10 show cages contained the birds from which Piet would select his six contestants for the Lizarddag. Another stack of 16 cages contained the birds sent to the Meijel show. That’s a total of 26 birds of show-quality London Fancies, a record for Piet, and probably the finest array of London Fancies seen for almost 150 years. On closer examination, they were a mixture of 2016 and 2017 birds in jonque (intensive yellow), mealy (non-intensive yellow, also known as schimmel on the continent), white, cinnamon (brown) and fawn (white-brown). They represent a dilemma for the future direction of the London Fancy. On the following day, all but the jonque and mealy birds would be rejected by the judges. I wrote about this in my show report and won’t repeat those comments here. The quality of the over-year birds was excellent, and I had to check the ring colours to tell them apart from the current-year birds. Piet told me that many birds improve in their second year, with even fewer black marks on their bodies, yet their wings and tails remained dark (2). This is contrary to what Victorian and Edwardian authors would have you believe, and may be unique to the Dutch strain, but that is by no means certain (3). The London Fancy is not recognised by COM at present, but is undergoing a three-year trial period. 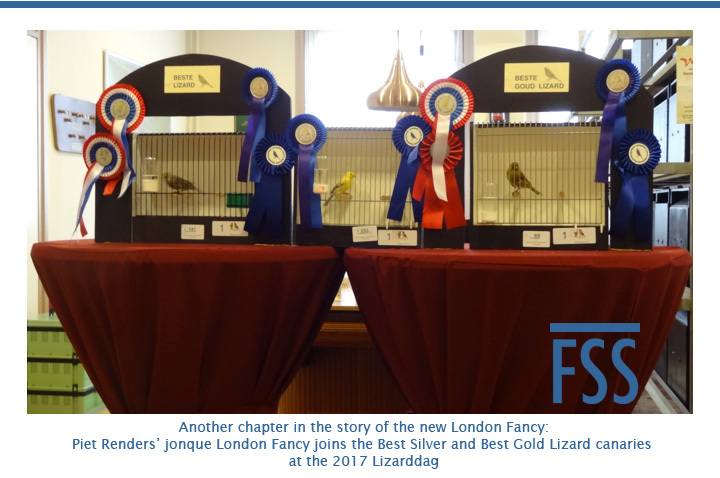 COM’s standard policy is to permit only first year canaries at the World Show, but in my opinion there is a case for making the new London Fancy an exception to that rule (a similar exemption applies to parrots & lovebirds for example). The pool of good show birds would be increased. It would encourage more fanciers to breed and exhibit the variety. COM would be seen to be making a positive contribution to the renaissance of an historic breed of canary. The revival of the London Fancy is at a critical stage; its future is by no means secure. Far too much depends on the hard work and dedication of one man. COM and its judges could make a big difference if the goodwill is there. Gallery: click on an image to see a larger version. I assume that most of my readers will be aware that Piet is the founding father of the Dutch strain of London Fancies. You can read a report of my visit to his home in 2016 here. An observation confirmed by Marko Dielen and others. The London Fancy was in decline by the 1850s, and so rare in the last quarter of the nineteenth century that I suspect that much of what was being written was based on hearsay rather than first hand observation. I so enjoy this site since I stumbled upon it while looking for info on European Serins. Every article is interesting and I look forward to being a lurker a long time to come ….. If possible are there any articles on the European Serin that I would find helpful, I am getting a pair in the coming weeks …. Will be traveling to pick them up and want to do the best for them. I am not a novice bird keeper but always am looking for new and informative information on my charges ….. I regret I have no experience of breeding serins, but I would be happy to publish articles and photographs if any of my readers would care to send them to me. Due to an annoying legislation, we have not been allowed to keep the cini for several years, unless with a permit. Now that this bird is allowed to be held by everyone without paperwork but with an appropriate ring issued by a recognized federation, the breeding with this popular bird starts to fare well. Although I have to mention that the cini easily suffers from coccidiosis, a dry aviary soil and good hygiene are also a necessity to keep cini’s successful and above all to breed. Even though cini’s are so small, they can still get quite aggressive during the breeding season. Best you can keep them on their own in an aviary because even though these big cini’s are not to be underestimated, especially goldfinches, greenfinches and siskins in short birds with yellow and green colors in their feathering are not safe for the cini. Although you probably can not treat them all the same. In large breeding cages of for example 80 cm wide, 40 cm high and 40 cm long they are probably also to be grown, but in an aviary of 1m wide 2m long and 2m high in which some fir branches are attached, they still come out best . As a diet it is best to give a seed mix for siskins, it is also very important to let the cini’s get used to a good egg food during the winter so that they can absorb this later during the breeding season when there are youngsters. Cini’s are crazy about weed seeds such as; ?bird wall?=Stellaria media, dandelion, street grass, peach herb, milk thistle, spice herb, evening primrose, meadowsweet, alder seed, birch seed, larch seed, greppelrus, etc. As a nesting place, the classic plank with a little conifer and a metal braided nest basket in the middle can prove good service. As nesting material they use short threads of cotton, jute, kapok, horsehair and coconut fiber, but they also appreciate street grass, ditch, and dandelion fluff. The eggs are dirty white with a light blue-green haze with small brown dots, the breeding duration is 13 days. If the parents have a good egg food, that they like to eat themselves, they will also feed this well to their young, if you also give a large variety of weed seeds chances are that they grow up without problems. The author then gives information on benching this small bird with some quotes on hybrids. If interested I can translate these lines of text too. Sorry for the poor english words and sentences, but i guess you can find the essence. Bravo to Piet and all those working to restore/recreate rare and lost varieties! Very interesting thought on the London fancy and overyear birds? I saw his birds at Stafford in 2016 and thought they were really good and so much nearer to what I thought a London fancy should be. The UK breeder’s need to take note. They have done good work but they all need to work together for the London fancy to success. David. i’m eager to translate it for fancies breeders on the french web site:eden canraris. I am willing for you to translate the article for your website provided a) the translated article is entire and accurate, b) it is not used for any commercial or political purpose, and c) I am acknowledged as the author and illustrator of the content. What are the percentages of green/cinnamon birds obtained (being carrier or not of some kind ) ? What are the percentages of those we can consider as spangled-backs ?